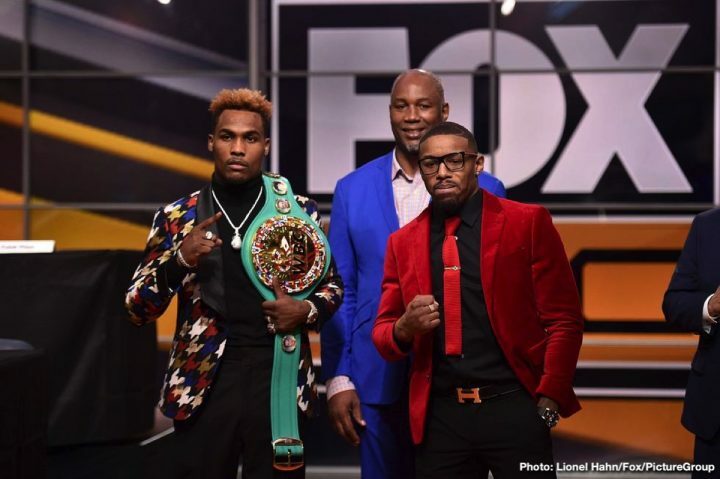 By Dan Ambrose: Jermell and Jermall Charlo don’t think much of Gennady Golovkin and Saul Canelo Alvarez due to neither of them showing interest in fighting them. The Charlos see GGG and Canelo as cowards, afraid to fight them. The Charlo brothers have the talent to defeat Canelo and Golovkin, but they’ve been foiled by their inability to get either of them to give them a fight. It would be a big career boost for both Charlo brothers if they could get a fight against Canelo and GGG, as it would put them on the map with the casual boxing fans. Canelo (50-1-2, 34 KOs) is now the WBC middleweight champion of the world, and Jermall (27-0, 21 KOs) is his mandatory challenger. Canelo, 28, will need to defend against Jermall sooner or later if he wants to hold onto his WBC title. If Canelo fails to take that fight, he’ll be stripped of his title by the WBC. Canelo and Golovkin have been making good money fighting each other lately, so it’s not been worth it for them to take a tremendous pay cut to face either of the Charlo brothers. Those two fighters bring more trouble than they’re worth right now. That could change in the future if they become more popular. The Charlos don’t fight often enough, and they’re not facing the best. The boxing public wants to see Jermell face Jarrett Hurd or Erislandy Lara, but he’s not done that. Jermell recently beat Austin Trout, Erickson Lubin, John Jackson and Charles Hatley. Those were not big enough names to increase Jermell’s popularity to a great extent. “They moved up from the weight classes, I think Canelo at 168, but he’s got a manager and a promoter and they know where we’re at,” said Jermall to TMZ. Jermall will be fighting next month against former 2-time middleweight world title challenger Willie Monroe Jr. (23-3, 6 KOs) at the Barclays Center in Brooklyn, New York. Charlo will be defending his interim WBC middleweight title that he won last April in beating Hugo Centeno Jr. by a 2nd round knockout. Jermall has been criticized heavily by boxing fans for him agreeing to defend against Monroe, who previously lost to Golovkin and Billy Joe Saunders in failed title challenges. As for Jermell Charlo (31-0, 15 KOs), he’ll be defending his WBC junior middleweight title against Tony Harrison (27-2, 21 KOs) in the co-feature bout on the Jermall vs. Monroe Jr. card on December 22 at the Barclays Center.